Poor ol' Ryan DeLuca didn't buy enough beer for his party. While he was out on a beer run, his idiot buddies busted out some mystical arcana and performed a demonic summoning ceremony. And this ceremony didn't just unleash a giant monster from hell-it also set off a domino effect of destruction, chaos, and madness, unleashing dinosaurs and demons, scientific perversions and unholy abominations, radioactive mutants and giant mechs. Buckle up! Join JOHN LAYMAN, multiple Eisner-winning co-creator of CHEW, and NICK PITARRA, Eisner-nominated co-creator of THE MANHATTAN PROJECTS, along with colorist MICHAEL GARLAND (THE MANHATTAN PROJECTS), for an eye-popping, face-melting, reality-defying nonstop rush of pure comic book action! 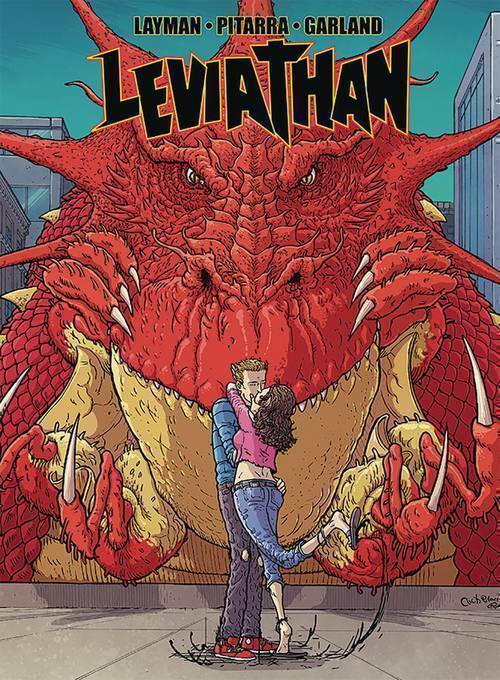 Collects LEVIATHAN #1-5.